The sinking of MV Sewol (Hangul: 세월호 침몰 사고; Hanja: 世越號沈沒事故), also called the Sewol ferry disaster, occurred on the morning of 16 April 2014, when the passenger/ro-ro ferry was en route from Incheon towards Jeju in South Korea. The South Korean ferry sank while carrying 476 people, mostly secondary school students from Danwon High School (Ansan City). The 6,825-ton vessel sent a distress signal from about 2.7 kilometres (1.7 mi) north of Byeongpungdo at 08:58 Korea Standard Time (23:58 UTC, 15 April 2014). In total, 304 passengers and crew members died in the disaster. Of the approximately 172 survivors, more than half were rescued by fishing boats and other commercial vessels that arrived at the scene approximately 40 minutes after the South Korean coast guard. The sinking of Sewol resulted in widespread social and political reaction within South Korea. Many criticized the actions of the captain and most of the crew. Also criticized were the ferry operator and the regulators who oversaw its operations, along with the South Korean government for its disaster response (including the poor showing of the then-South Korean coast guard) and attempts to downplay government culpability. On 15 May 2014, the captain and three crew members were charged with murder, while the other 11 members of the crew were indicted for abandoning the ship. An arrest warrant was also issued for Yoo Byung-eun, the owner of Chonghaejin Marine, which operated Sewol, but he could not be found despite a nationwide manhunt. On 22 July 2014, police revealed that they had established that a dead man found in a field 415 kilometres south of Seoul was Yoo. Foul play was ruled out. At the time of her purchase by Chonghaejin Marine in 2012, the ship that would come to be known as the Motor Vessel (MV) Sewol was 18 years old and dilapidated. She was originally named Ferry Naminoue and was operated from 1994 to 2012 as a transport ship for cargo and passengers by the Japanese company A-Line Ferry. :9 According to A-Line Ferry, she did not experience any problems while being operated by the company in Japan. After she was purchased on 8 October 2012, she was registered by Chonghaejin on 22 October 2012 and underwent modifications from 12 October 2012 to 12 February 2013.:9 The modifications were later found to have been based on an illegal redesign of the ship. Sewol began operations on 15 March 2013. She made three rounds trips per week from Incheon to Jeju, each one-way voyage of 425 kilometres (264 mi) taking 13.5 hours to complete. On 19 February 2014, she received an interim inspection and a periodic inspection from the Register. :17 She had made the round trip a total of 241 times until the day of the incident. On 15 April 2014, Sewol was scheduled to leave the port at Incheon at 6:30 pm, Korea Standard Time. A fog which restricted the visible distance to less than 1 kilometre (0.62 mi) led the Incheon Vessel traffic service (VTS) to issue a low visibility warning around 5:30 pm, leading the Shipping Association to hold Sewol's departure. The VTS retracted the warning around 8:35 pm, and the Shipping Association removed the restriction on Sewol's departure after checking the weather conditions with the operator of the Palmido lighthouse and consulting with the Korean Coast Guard. :30 She departed around 9 pm, and was the only ship to leave port that evening. When she departed, she was carrying 443 passengers, 33 crew members, and a total of 2,142.7 tons of cargo including 185 cars. :31 325 of the passengers were students on a field trip from Danwon High School and five passengers were of non-Korean nationality. The ship was commanded by 69-year-old Captain Lee Joon-seok, who had been brought in as a replacement for the regular captain. He had over 40 years of experience at sea, and had traveled the route before. He was hired on a one-year contract, with a monthly salary of ₩2.7 million (roughly 2,500 USD). Lee worked with 33 crew members for the journey, of which 19 were irregular, part-time workers. Later investigations discovered problems concerning the state of Sewol at the time of departure. The Safety Investigation Report made by the Korea Maritime Safety Tribunal noted that Sewol at the time of departure was carrying 2,142.7 tons of cargo when its maximum allowance was 987 tons. :34 TIME magazine further noted that the cargo had been improperly secured. The Report also noted that only 761.2 tons of ballast were taken on board, that some ballast tanks had not been properly maintained, and that the last voyage was made without making further adjustments to the ballast during the journey. :36–37 Kukmin Ilbo reported that Captain Shin, the regular captain of Sewol, had warned the company about the decrease in stability and passenger satisfaction and attributed it to the removal of the side ramp. Captain Shin claimed that the company responded with threats to fire him if he continued his objections. Captain Shin's warnings were also relayed through an official working for the Incheon Port Authority on 9 April 2014, which an official from the company responded to by stating that he would deal with anyone making the claims. The Korea Herald also reported that the captain had requested a repair for the malfunctioning steering gear on 1 April 2014, which was not done. The Daily Telegraph reported that the Korean Register of Shipping had noted in a stability test report dated 24 January 2014 that Sewol had become 'too heavy and less stable after modifications were made.' The New York Times reported that the company budget for the safety training of the crew was US$2, which was used to buy a paper certificate. As Sewol approached the fatal turn, breakfast was being served in the cafeteria. Kim Seong-mok, a passenger, later recalled having eaten breakfast right before the incident. CCTV data taken at 8:40 a.m. also showed students present and socializing on the deck. Another passenger, Choi Eun-seun, recalled having gone up to the deck to smoke right before the incident. There are conflicting accounts of what happened next. According to Park's testimony, after she had used the radar to check that Sewol's course was changed and the current course was set to 140 degrees, Park ordered Cho to change the course of the ship further to 145 degrees. The order was given at 8:48 am. After realizing that the ship was heavily listing to port which led the bow to turn to the right, she gave an order to turn the wheel to port. :40 Immediately after giving the order, she heard Cho exclaim "the wheel isn't working" in a flustered voice, after which the ship started listing. The testimony of the Chief Engineer did not notably differ from that of Park. Cho testified that the listing of the ship began with the order to turn to 140 degrees. According to Cho, he only received the order to change the course to 140 degrees, and not the order to change the course to 145 degrees. Because the ship kept turning towards the right even as he was holding onto the wheel, he made two turns to the left amounting to a 5-degree turn. Because the ship did not stop its rightward turning, it was eventually facing a 145-degree course. Cho testified that Park gave an order to turn "in the opposite direction" at this point, which he followed by turning the ship further to the left by 10 degrees, so the total amount of the turn became 15 degrees to the left. The court came to the conclusion that Cho's steering led the ship to attempt a 15-degree turn for 40 seconds. The court concluded that Cho, who was flustered by the ship turning faster than expected when he was following Park's order to turn to 145 degrees, was attempting to turn to the left when he took Park's order to mean a turn in the opposite direction. This led him to make a turn to the right, causing the front of the ship to rapidly turn right. 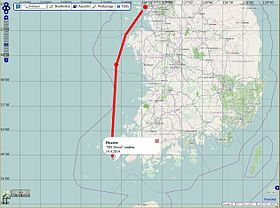 Later analysis of Sewol's track chart by the Ministry of Oceans and Fisheries revealed that the ship's Automatic Identification System had stopped collecting data from 8:48:37 to 8:49:13; consequently, the Ministry and the Jindo Vessel traffic service (VTS) lost 36 and 29 seconds of data, respectively. While earlier reports and investigations believed that there was a power outage, Huh Yong-bum, the head of the expert advisory panel on the police-prosecution joint investigation team, testified that the AIS failure was due to system limitations and that the failure did not affect the steering. According to the joint investigation team, the sharp turn was a combined result produced by the steering error and the lessened restoring force caused by overloading; investigations did not show any malfunctions with the generator or the battery. From 8:49:26, AIS data showed Sewol's angular velocity accelerated from 0.29 radians per second to 0.83, 1.00, and 2.00 until 8:49:39; these readings were consistent with previous testing data gained from earlier tests conducted on an empty Sewol. Consequently, the ship herself listed 20 degrees into the water; on 8:49:40, causing cargo to fall to one side of the ship. The impact caused the ship's gyroscope to erroneously record angular velocities of 15 radians per second on 8:49:40, 14 on the next second, and −11 on the consequent second, and tilt the ship 10 degrees further into the water. Passengers also reported hearing a loud "bang." As Helmsman Cho sharply turned the wheel from 135 to 150 degrees, Sewol began to list to port and tilt towards the water. The overall effect was that the ship turned about 45 degrees to the right, then rotated 22 degrees on the spot for a span of 20 seconds. The cargo falling to one side of the ship caused Sewol to lose all her restoring force and allowed water to flow into the ship through the side door of the cargo loading bay and the car entrance located at the stern. This scenario was confirmed by simulations separately run by the expert advisory panel on the joint investigation team, the Korea Research Institute of Ships and Ocean Engineering, and the Advanced Marine Engineering Center of Seoul National University. The chief engineer testified that the tilting lasted for about two to three minutes after the initial tilt. During this time, Oh Yong-seok, an off-duty helmsman who was sleeping in his cabin, was awakened when he was thrown against its port side. As of 8:50 am, Sewol was leaning 30 degrees to port. Captain Lee, who was in his private cabin at the time of the incident, immediately rushed to the bridge. After a short period, all the ship's mates and helmsmen arrived there as well. Around this time, the chief engineer stopped the engines, although it is unknown whether it was on his own volition or following an order from Captain Lee. At 8:50, the chief engineer ordered an evacuation of the engine room through a call to the assistant engineer. During this time, Park was crying, as she was taken aback by the sudden incident; this lasted until at least 9:06 am. With the engines off, Sewol became unable to change directions and began drifting sideways. A passenger later testified that lights went out after the ferry started listing. Do not move. Just stay where you are. It's dangerous if you move, so just stay where you are. As Sewol began sinking, the ferry's intercom system started ordering the passengers to stay put, alleging that moving was dangerous. The announcements were made by a communication officer, Kang Hae-seong, who had not consulted the manual before the broadcast. The announcements began broadcasting by at least 8:52 am. and continued even when water began flooding passenger compartments. Other crew members corroborated this order, instructing passengers to stay put. Captain Lee also instructed passengers to stay put and did not change the order even as he was leaving the ship. The first emergency call was made by Choi Duk-ha, a Danwon high school student aboard the ferry. At 8:52 am, he called the national emergency service number and reported to the Jeollanam-do fire station that Sewol was capsizing. Choi was connected to the Mokpo Coast Guard at 8:54 a.m. and was asked to give the latitude and longitude of the ship's location. Three minutes later, the Mokpo Coast Guard station situation room ordered patrol vessel No. 123 to be dispatched to the scene; the vessel was launched at 8:58 am. Following the Coast Guard search and rescue manual, the boat was to be in charge of surveying the area and "swiftly" rescuing passengers. Choi did not survive the capsizing and was later found dead. At 8:55 am, Sewol's crew made their first distress call to the Jeju vessel traffic service and asked the Jeju VTS to notify the Coast Guard, as the ferry was rolling and in danger. At 8:56 am, the Jeju VTS called the Jeju Coast Guard. Three minutes later, the Jeju Coast Guard called the Mokpo Coast Guard and discovered that a patrol boat had already been dispatched. At 9:01 am, a crew member on Sewol called the Incheon branch of Chonghaejin Marine to report the situation, and the Chonghaejin Marine headquarters located in Jeju then called Captain Lee at 9:03 a.m. for a report of the situation. The Incheon branch then talked with the first mate in five telephone calls over the next 35 minutes. At 9:06 am, the Jindo VTS were informed of the capsizing incident by the Mokpo Coast Guard. Around this time, the crew began communicating with the Jindo VTS, which was closer to their location. For the next two minutes, Jindo VTS alerted two other ships that Sewol was sinking, with one confirming that it had visual contact with the ship. At 9:07 am, Sewol's crew confirmed that the ferry was capsizing and requested the help of the Coast Guard. At 9:14 am, the crew stated that the ship's angle of heel made evacuation impossible. Around this time, the captain of Patrol Vessel 123 was appointed the commander of the scene. Four minutes afterwards, the crew of Sewol reported to the VTS that the ferry had heeled more than 50 degrees to port. At 9:23 am, the VTS ordered the crew to inform the passengers to wear personal flotation devices. When the crew replied that the broadcasting equipment was out of order, the VTS told them to personally order the passengers to wear life jackets and more clothing. At 9:25 am, the VTS asked the captain to decide quickly whether to evacuate the ship, stating that they did not have enough information to make the decision. When the captain inquired about the rescue, the VTS replied that patrol boats were due to arrive in 10 minutes and a helicopter in one minute. The captain then replied that there were too many passengers for the helicopter. During this time, the captain told passengers to stay in their rooms. The communications officer, using the ship's intercom, repeatedly ordered passengers not to move. Around 9:30 am, the captain gave orders to evacuate the ship, though the order may not have been relayed to all the passengers. At 9:33 am, after confirming that nearby ships had volunteered to help in the rescue operations, the VTS told all ships to drop lifeboats for the passengers. At 9:38 am, all communications were cut off between the VTS and the ferry. About three minutes after all communications were cut, about 150 to 160 passengers and crew jumped overboard. Sewol took two and a half hours to sink. By around 11:18 am, the stern was submerged, with a section of the hull about 2 metres (6 ft 7 in) high and 20 to 30 metres (66 to 98 ft) long showing above the water. At 12:00 noon on 16 April, only 50 centimetres (20 in) of the bulbous bow was above water. As of 1:03 pm, the ship was completely submerged. During the capsizing, some members of the crew drank beer. The crew also communicated by telephone with staff from Chonghaejin Marine at seven different times. As passengers stayed in their cabins as instructed, the captain and crew members abandoned the ship. The captain, the chief engineer, and the chief and second mates were the first people to be rescued. The captain was rescued around 9:46 am. As the ship capsized, some passengers followed the announcements to stay put, even as the water came in. Most of the student passengers obeyed the announcements. Some passengers who climbed to the top of the ship or jumped into the water were rescued. Videos made recording passengers during the capsizing have been recovered. Some recorded the announcements telling passengers to stay in place and put on life jackets, while some showed passengers joking around, putting on life jackets, and sending farewells. Passengers made calls and sent text messages and KakaoTalk mobile messages during the capsizing. The last message was sent at 10:17 am. Text messages and social media posts allegedly made by survivors after the capsizing have circulated in the media, but an investigation by the Cyber Terror Response Center found that passengers did not use their phones between 12:00 p.m. on 16 April and 10:00 a.m. of 17 April and that all the reported survivors' messages were fake. During the capsizing and the subsequent reporting, the government's announcements, as well as those from the media, were inconsistent and inaccurate. An editorial in The Huffington Post stated that the governmental reports were like a rubber band, 'increasing at one moment and decreasing at another.' Newspapers such as The JoongAng Ilbo, MBN, and JTBC later made corrections and apologies concerning their earlier reports. Conspiracy theories were also present in the aftermath of the sinking. At 8:58 a.m. (KST) on 16 April 2014, the Mokpo Coast Guard dispatched patrol vessel No. 123 in response to the first report of the incident. After receiving the news of the capsizing from the Jeollanam Provincial Government, the Republic of Korea Navy 3rd Fleet sent a Gumdoksuri-class patrol vessel (PKG) to the accident site at 9:03 am; the Navy dispatched another PKG at 9:09 am. At 9:04 a.m., the government created the Central Disaster Countermeasure Headquarters (중앙재난안전대책본부), as an organization which would directly report to the government. The South Korean coast guard set up a rescue operations headquarters at 9:10 am. Patrol vessel No.123 arrived at the scene near 9:30 am. as the first ship to reach the site after the incident. During the time between the dispatch and the operations, members failed to raise Sewol, and chose to call for other ships on the radio. Consequently, members on the vessel had not directly communicated with Sewol, and were not aware of the content of the communication between Sewol and the Jindo VTS on arrival. At the time of arrival, Sewol had listed about 50 to 60 degrees to port. When the vessel arrived, members made announcements for five minutes, calling people to abandon ship and jump into the water. The vessel began rescue operations at 9:38 am, with the dispatching of a rubber boat. Passengers who had reached the deck or jumped into the water were rescued, including the captain, but rescue members could not get inside the ship due to the list. People trapped inside the pilothouse were rescued by breaking through the windows. At 9:35 am, the Korean Ministry of National Defense started operating Counter-disaster Headquarters (재난대책본부). At 9:40 am, the Ministry of Oceans and Fisheries declared the accident to be the highest state of emergency in terms of naval accidents; consequently, the Central Accident Response Headquarters (중앙사고수습본부) was established. At the same time, the Ministry of Health and Welfare sent emergency vehicles and the first squad of the Disaster Medical Support Team (재난의료지원팀) to Jindo. At 11:28 a.m., the Korea Navy's Ship Salvage Unit (SSU) was reported to have been deployed for the operations. At 2:42 pm, 150 special forces personnel from the ROK Army Special Warfare Command, including 40 scuba divers, were sent for the operation. At this point, 196 personnel, including 82 in the SSU and 114 in the ROK Naval Special Warfare Flotilla were involved in the operations. At 3:07, the regional government of the Gyeonggi Province was reported to have started operating the Prevention and Countermeasures Headquarters (재난안전대책본부). After 5 p.m., units from the SSU began undersea operations. At 5:13, the Gyeonggi-do Office of Education was reported to have started operating the Ansan Danwon High School Accident Countermeasures Report Compiling Headquarters (안산 단원고 사고대책 종합상황본부). At 8:00, operations investigating the ship's hull were ceased. As of 22:03, the following units were involved in rescue operations: Naval forces include sailors from the 3rd Fleet (제3함대; 第三艦隊), a Dokdo-class amphibious assault ship, a Chungmugong Yi Sun-sin-class destroyer, and an Ulsan-class frigate. The ROK Air Force sent support units such as the Lockheed C-130 Hercules, Sikorsky HH-60 Pave Hawk, and HH-47 variant of the Boeing CH-47 Chinook. The ROK Army sent units including 150 Special Warfare Command soldiers and 11 ambulances. 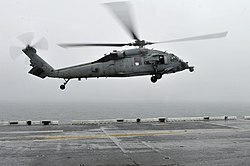 A U.S. Navy MH-60S Seahawk helicopter conducted search and rescue operations at the request of the South Korean navy near where Sewol sank, on 17 April 2014. Starting on 17 April, Undine Marine Industries Co., a privately held company, began to lead the search for missing passengers. At 12:30 am, hull investigations were started by the ROK Coast Guard with the help of flares. As of 6:00 am, 171 ships, 29 aircraft and 30 divers were involved in the rescue effort. The Korea Coast Guard had assigned 20 divers in teams of two. The ROK Navy also assigned eight divers, but the coast guard prevented them from participating and waited for divers from Undine Industries. At 7:24 am, civilian groups of expert divers were reported to be helping out in the rescue operations. During the morning, the number of divers involved in the operations reached 555. The Navy also established a military control tower on a Dokdo-class amphibious assault ship. Starting around 2:00 pm, rescue operations were practically stopped due to bad weather conditions. A marine crane arrived on the scene at night. At 10:50 a.m. on 18 April, the ROK Coast Guard began pumping in air to support possible air pockets. At the same time, divers entered the capsized ship's hull but only gained access to the cargo deck. The divers' entrance was later labeled a 'failure' by the Central Disaster Countermeasure Headquarters. On 19 April, a Navy petty officer who was injured during rescue operations died. On 21 April, remotely operated underwater vehicles began to be used for operations. On 24 April, the CR2000 'Crabster' robot was sent to the rescue site. On 6 May, a diver working for Undine Marine Industries died during the search. This was followed by another diver's death on 30 May. On 17 July, a firefighting helicopter returning from rescue operations crashed near an apartment complex, killing all five officers aboard and injuring a high school student. The South Korean government announced on 22 April 2015 that it had approved plans to salvage the wreckage of Sewol in hopes of finding more information about the sinking and recovering the bodies of the nine victims still missing. The plan was initially put forward by president Park Geun-hye, and was endorsed by the Minister of Public Safety and Security, Park In-yong. The operation was expected to take as long as 18 months and to cost between $91 and $137 million. At 11:01 am, Munhwa Broadcasting Corporation (MBC) began reporting that all students had been rescued; this news was re-reported by other news organizations, and continued until 11:26 am. Around 11 a.m. (KST), officers working for the educational departments for the Gyeonggi Province sent text messages to the students' parents stating that all students had been rescued. The officers' belief was apparently confirmed by a police officer in the Danwon Police Department. Initial reports stated that rescuers retrieved 368 people from cold waters as the passengers, mostly students, had jumped overboard when the vessel started sinking; the South Korean government later corrected this statement, saying 295 passengers remained missing. 22 of the 29 crew survived, including 15 responsible for the navigation. Early in the rescue efforts, a 27-year-old female crew member was found dead inside the sinking vessel and a male high school student died shortly after arriving at a hospital. In its 17 April morning edition, The Chosun Ilbo reported that 174 people had been rescued, 4 had died, and 284 were missing. According to CNN and its affiliate YTN, six people died. News1 Korea reported that, as of 8:00 a.m. on 17 April 179 people had been rescued, 6 had died and 290 were missing. Three more people were found dead at 11:00 a.m. and the confirmed death toll rose to 9. At 10 pm, Yonhap news confirmed that the death toll had risen to 14. By the morning of 18 April, the death toll had risen to 28. On 19 April, the death toll rose to 36. By 20 April, the death toll reached 49. By 6 May, a diver searching the sunken ferry had died; not including the diver, the death toll in the ferry disaster rose to 264, with 38 people still missing. By 10 May 2014, the death toll reached 275, with dozens more still missing. By 21 May, the death toll had risen to 288, leaving 16 missing. As of 21 May, the 16 missing were 7 Danwon High School students, 3 Danwon High School teachers, 4 other passengers, and 2 cabin crew members. On 5 and 6 June, one dead passenger and one dead cabin crew member were found, bringing the casualty count to 290, while the number of missing passengers was reduced to 14. By 9 June 2014, a 28-year-old female Danwon High School teacher as well as a 17-year-old male Danwon high school student were found bringing the death toll to 292 and leaving 12 missing. On 24 June, the body of a female student was recovered bringing the death toll to 293 and lowering the missing to 11, including 5 Danwon High School students. The death toll stands at 294 as of 22 July 2014, with 10 missing; the date marked the recovery of the last cabin crew member. The sinking of Sewol is the deadliest ferry disaster in South Korea since 14 December 1970, when the sinking of the ferry Namyoung killed 326 out of the 338 people aboard. The American warship USS Bonhomme Richard was sent to assist in the air-sea rescue operation, but did not get the approval of the ROK Navy for its helicopters to participate in the rescue. USNS Safeguard was sent to South Korea to take part in the rescue operation. The Japan Coast Guard offered support, as well as a message of sympathy and condolences from the Japanese government. The ROK Coast Guard declined the offer, saying that, while the offer was welcome, special assistance was not needed on this occasion. The President of Singapore, Prime Minister of the United Kingdom, President of China, Vice Premier of Vietnam, and Pope Francis of the Holy See all expressed condolences to the South Korean Government. An unnamed North Korean official stated "this sinking is ultimately the responsibility of the inhumanity and ineptness of the Park Geun Hye regime; the aforementioned are the primary causes of this crime that has caused such senseless loss of life." As of 17 April 2014, the South Korean coast guard concluded that an "unreasonably sudden turn" to starboard, made between 8:48 and 8:49 a.m. (KST), was the cause of the capsizing. According to the Coast Guard, the sudden turn caused the cargo to shift to port, causing the ship to list and to eventually become unmanageable for the crew. The existence of the sudden turn has been confirmed by the analysis of the ship's Automatic Identification System data. The crew of the ferry has agreed that the main cause was the sudden turn. Experts such as Lee Sang-yun (이상윤), a professor and head of the environment/maritime technology institute of the Pukyong National University, have also agreed. Overloading and improperly secured cargo are also being seen as direct causes. MV Sewol was carrying 3,608 tons of cargo, more than three times the limit of 987 tons. It is estimated that the actual cargo on the day of the accident weighed 2,215 tons, including 920 tons of trucks, cars and heavy equipment, 131 tons of containers and 1,164 tons of general goods. The cargo included building materials destined for naval bases on the island of Jeju. The overloading was also previously noted by an off-duty captain and the first mate. Lee Sang-yun also proposed overloading as a cause. According to the off-duty captain of Sewol, the ship owners ignored his warning that the ship should not carry so much cargo because she would not be stable. Sewol was carrying only 580 tons of ballast water, much less than the recommended 2,030 tons; this would make the vessel more prone to list and capsize. South Korean newspaper The Chosun Ilbo argued that the discharging of ballast water was a cause of the incident. The crew had reportedly pumped out hundreds of tons of ballast water from the bottom of the ship in order to accommodate the additional cargo. Secondary causes also contributed to the capsizing of the ferry by decreasing the restoring force. The crew of the ferry stated that the lack of restoring force was a cause of the disaster. The Prosecution/Police Coalition Investigations Headquarters (검경합동수사본부) is currently investigating secondary causes which could have lessened the ship's restoring force. Renovations which added extra passenger cabins have been proposed as a main secondary cause by Kim Gill-soo (김길수), a professor in the maritime transport technological department at the Korea Maritime University. This possible cause has also been supported by the captain, as well as Lee Sang-yun. Gong Gil-young (공길영), a professor of aviation engineering at Korea Maritime University, commented that the sudden turn was simply the 'first cause' and that there were secondary causes to the incident. He advocated an explosion as the most probable secondary cause. At the beginning of the investigation, the ROK Coast Guard thought that the cause was a collision with a reef, believing this likely because the area was foggy. The captain denied this was the cause of the accident, and a reef collision has been dismissed as a cause by consensus among experts. The theory is also not currently advocated by the Coast Guard. Dmitry Verkhoturov, a Russian independent investigator, claimed that the main cause of the incident was strong underwater stream in the Maenngol Channel, while the ferry passed it. On 19 April, the captain of the ferry was arrested on suspicion of negligence of duty, violation of maritime law and other infringements. The captain had abandoned the ship with passengers still aboard the ferry, while South Korean law explicitly requires captains to remain on the ship during a disaster. Two other crew members, a helmsman and the third mate, were also arrested on that day on suspicion of negligence and manslaughter. By 26 April, twelve further arrests had been made with the whole crew responsible for navigation in detention. On 15 May, Captain Lee Jun-seok, First Mate Kang Won-sik (who was responsible for managing the ship's ballast), Second Mate Kim Young-ho, and Chief Engineer Park Gi-ho were indicted on charges of homicide through gross negligence (also described as murder), which carry a potential death penalty. The other eleven crew members face lesser charges of abandoning the ship and ship safety offences. 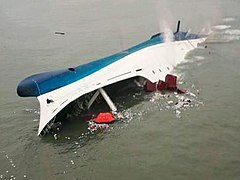 Three crew members, Park Ji-young, Jeong Hyun-seon, and Kim Ki-woong, are credited by survivors with staying aboard the ferry to help passengers escape. All three went down with the sinking vessel. On 8 May, the chief executive of Chonghaejin Marine, Kim Han-sik, was arrested and faced charges including causing death by negligence. Four other company officials were also taken into custody. The Ministry of Oceans and Fisheries revoked Chonghaejin Marine's license to operate ferries on the Incheon-Jeju Island route in May 2014. Yoo Byung-eun, former chairman of Chonghaejin Marine, ignored Incheon District Prosecutors' Office summons, and went into hiding. On 22 May, the Incheon District Court issued an arrest warrant and Korean authorities offered a ₩50 million (US$48,800) reward for information leading to the arrest of Yoo. On 25 May, the reward was raised tenfold to ₩500 million (US$488,000). On 21 July 2014, it was reported that a body found in a field in June was believed to be Yoo's. The disaster raised questions regarding governmental regulation of shipping in South Korea. Shipping is regulated by the Korean Shipping Association, which is also an industry trade group, which experts consider a likely conflict of interest. In addition, government regulators outside the Association frequently move to jobs as part of the association after their government service. Yun Jong-hwui, a professor at Korea Maritime and Ocean University, notes that while South Korean regulations are strong, they are often poorly enforced. On 3 June, the Gwangju District Court issued arrest warrants for a senior vessel safety operator of the Korea Shipping Association's Incheon unit and a vessel inspector of the Korean Register of Shipping's Mokpo unit. Amongst 15 crew accused of the sinking, prosecutors sought the death penalty for the captain under the charge of homicide and the prosecution told the court that he failed to carry out his duty. Lead prosecutor Park Jae-eok said: "Lee supplied the cause of the sinking of the Sewol...he has the heaviest responsibility for the accident. We ask that the court sentence him to death." While no formal pleas were made, Lee denied intent to kill. The others had lesser charges, including negligence. A three-judge panel would announce its verdicts in November. The Incheon District Court, on Wednesday, 5 November, sentenced the late ferry owner Yoo Byung-eun's eldest son Yoo Dae-kyoon to three years in prison for embezzlement and breach of trust. On 11 November 2014, the Gwangju District Court found Captain Lee Jun-seok guilty of negligence and he was sentenced to 36 years' imprisonment. The judges said that he was clearly not the only person responsible for the tragedy and they accepted that his negligence did not amount to an intent to kill. The chief engineer of the ferry, identified by his surname Park, was found guilty of murder and jailed for 30 years. Thirteen other crew members were given jail sentences of up to 20 years on charges including abandonment and violating maritime law. Relatives of victims were distraught at the verdict, with some weeping. The AFP news agency reported that one woman screamed in the courtroom: "It's not fair. What about the lives of our children? They (the defendants) deserve worse than death." In the cases against officials over the overloading of cargo, Kim Han-sik, Chonghaejin Marine's chief executive, was found guilty of negligence and received a ten-year prison term. Six other company employees and a Korean Shipping Association official also received prison sentences. Following appeals by prosecutors and the accused, on 28 April 2015 Captain Lee was found guilty of murder and his sentence increased to life imprisonment, while those for 14 other crew members were reduced to a maximum of 12 years, including 10 years for chief engineer Park, whose murder conviction was overturned. Judge Jeon Il-ho explained: "We drew a distinction between the Captain Lee Joon-seok who has a grave responsibility and crew members who took orders from the captain." Kim Han-sik's sentence was also reduced to seven years on appeal. Pope Francis wearing a yellow ribbon on his 2014 state visit to South Korea. Before his visit, he said that he "hoped the South Korean people take the Sewol tragedy as an occasion for moral and spiritual rebirth." In addition to reaction against the actions of the captain and much of the crew of Sewol, there has been a much wider political reaction to the disaster. Criticism has ranged from anger at the lax regulatory environment which may have contributed to the safety violations that could have sunk Sewol, to anger about the rescue operations, to anger at Park Geun-hye, then President of South Korea, whose approval ratings fell from a high of 71 percent before the disaster to "the 40 percent range" weeks afterwards. Political reaction to the Sewol sinking has been intensified by a series of events. A prominent South Korean politician from the ruling Saenuri Party, Chung Mong-joon, was forced to apologize when his son wrote a controversial Facebook post criticizing the public for criticizing the government over the disaster. Many parents of the victims of the tragedy have been expressing deep anger at the government, ranging from reportedly berating Prime Minister Jung Hong-won to shouting at President Park Geun-hye, to parents staging protests at the presidential palace itself, partly inflamed by a reported remark by a senior news editor at the government-influenced Korean Broadcasting System that the number of dead in the ferry tragedy was "not many, compared with the number of people killed in traffic accidents each year". Barack Obama, then President of the United States, sent his condolences, stated that the United States would help in the search for survivors, and during a state visit to South Korea presented a magnolia tree from the White House to the high school. Japanese prime minister Shinzo Abe offered sympathy to the victims. Truong Tan Sang, the President of Vietnam, as well as the deputy prime minister and the minister of foreign affairs, sent their condolences to Yun Byung-se, South Korea's Minister of Foreign Affairs. Singapore's Prime Minister Lee Hsien Loong sent their condolences to the president of South Korea. Xi Jinping, the President of China, sent messages on condolences to Park. On 23 April, North Korea sent its condolences. On 27 April, Jung Hong-won, the prime minister of South Korea, accepted responsibility and announced his resignation. On 29 April, South Korean president Park Geun-hye indirectly apologized for the government's response to the ferry sinking. On 18 May 2014, the BBC reported that President Park Geun-hye announced South Korea "plans to break up its coastguard" after it had failed to respond well during the MV Sewol ferry disaster. According to Park, "investigation and information roles will be transferred to the Korean police while the rescue and salvage operation and ocean security roles will be transferred to the Department for National Safety which will be newly established". On 19 November 2014, the Korea Coast Guard ceased control as the Ministry of Public Safety and Security was founded on the same day. On 17 April, a representative of the Cheonghaejin Marine Company apologized for the incident. The chairman and CEO of Korean Register of Shipping, Chon Young-Kee, resigned on 28 April, following raids on KR offices by South Korean prosecutors. On 18 April, the rescued vice principal of Danwon High School, Kang Min-kyu, 52, committed suicide by hanging himself. Kang had organized the field trip that had brought the high school party aboard the ship, and had written in his two-page suicide note, found in his wallet by police, that "Surviving alone is too painful when 200 lives are unaccounted for ... I take full responsibility." The note ended with a request that his body be cremated and the ashes scattered over the site of the accident, "that I might be a teacher in heaven to those kids whose bodies have not been found." On 22 April, a netizen made a post encouraging others to take part in a yellow ribbon campaign on KakaoTalk. The image accompanying the post had a caption stating, 'One small movement, big miracles'. Since then, the yellow ribbon has been used to symbolize mourning for the sinking victims. The ribbons are prominent in social media, sometimes as profile photos, and were used by celebrities such as Jo Kwon and Hye-rim Park. In 2017, the yellow ribbon campaign received renewed media coverage as various musicians wrote songs with references to the symbol or were seen wearing the ribbon during performances and celebrities posted images of the ribbon on their social media sites to commemorate the third year after the disaster. The disaster is the subject of the 2014 documentary film Daibingbel: The Truth Shall Not Sink with Sewol. The director's cut of the film was made available for public viewing on YouTube on 31 August 2015. The disaster is also subject of another documentary in 2016, After the Sewol. On 17 April 2015, a day after the first anniversary of the sinking, 4,475 participants holding electronic candles formed the shape of the Sewol ferry at the commemoration event titled 'The Saddest Challenge in the World' in Seoul Plaza in front of City Hall. The event continues to be memorialized by Korean students in school ceremonies. On 22 March 2017, the salvage operation began to raise the wreck of sunken Sewol. A Chinese consortium, Shanghai Salvage Company, was contracted by the South Korean government to carry out the salvage operation. The ship was lying on its port side, nearly 40 metres below the surface. Diesel and oil were drained from the ship. All the cabins were sealed and a huge fence was erected on the seabed to prevent any wreckage from drifting away. A crane lifted the bow of the ship five degrees so that 33 lifting beams could be placed underneath. The salvage crew pumped water out of the ship's ballast tanks and attached air bags to increase the ship's buoyancy. Cables were attached to the lifting beams and a strand jack system was used to gradually lift the ship to 13 metres above the surface, where it was then attached to a barge. The ship was then towed and loaded onto a semi-submersible vessel, White Marlin. The ship was loaded onto self-propelled modular transporters (SPMTs) while on the vessel, which then transported it to shore. 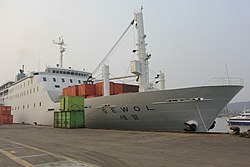 The vessel docked at Mokpo, where ALE were contracted to unload the ship using the SPMTs. Bones reportedly found within the ferry were analyzed and affirmed to be of animal origin. As of 5 June 2017, the remains of Danwon High School student Cho Eun-hwa and passenger Lee Young-sook have been discovered and positively identified. The remains of a third victim have been discovered relatively intact, although DNA testing is still ongoing to determine the identity of those remains. On 16 November 2016, the report about the MV Sewol incident for President Park Geun-hye was revealed. This report was written by National Intelligence Service. The report referred to the incident as "just a ferry accident (여객선 사고)" and said "we must control the protest in the name of ferry accident (여객선 사고를 빌미로 한 투쟁을 제어해야 한다)". In the report, there is no mention about demanding the truth, salvaging the hull, or supporting the victims' families. The report talks about only a "control the protesting attempt by the opposition forces in the name of the ferry accident and suggest a method about public opinion manipulation using the government-organized demonstrations. The MV Sewol disaster contributed to the political downfall of Park. As criticism of her handling of the incident grew stronger, the Park administration established a commission to monitor and prosecute her critics. Tatsuya Kato, a Japanese journalist, was indicted on charges of defamation for reporting that President Park Geun-hye had responded to the disaster by meeting with a fringe religious leader named Choi Soon-sil. In 2016, the full extent of Choi's ties to Park emerged in South Korean media, which caused a corruption scandal that ultimately resulted in her impeachment by the National Assembly on 9 December 2016. A unanimous Constitutional Court ruling on 10 March 2017 upheld the impeachment vote, ending her presidency. After Park was removed from office, her documents were searched and it was discovered she had made a secret list of artists who would be banned from receiving any sort of government acknowledgement or sponsorship of their work. It was further discovered that the initial purpose of this blacklist was to censor those who commemorated the Sewol victims in artwork. In July 2017, members of the Park administration were imprisoned for up to three years for their role in creating the illegal blacklist. ^ 동거차도에서 본 이 시각 구조 현장 [Current Rescue Scene as seen from Donggeochado] (in Korean). YTN. 22 April 2014. Retrieved 24 September 2014. ^ a b "Two Sewol ferry victims laid to rest". Yonhap News. 9 September 2017. Retrieved 26 October 2017. ^ "South Korea ferry search diver dies". Agence France-Presse. The Guardian. 30 May 2014. Retrieved 24 September 2014. ^ "Sewol ferry search helicopter crash kills 5 in South Korea". CNN. 17 July 2014. Retrieved 26 October 2017. ^ "Why Seizing Ferry Owner's Assets Is Vital". The Chosun Ilbo. Chosun.com. 22 May 2014. Retrieved 24 September 2014. ^ Jeong, Hunny (12 August 2014). "Three-pronged effort to investigate Sewol". The Korea Herald. Retrieved 24 September 2014. ^ "Sewol trial: South Korea coast guard was 'ill-equipped'". BBC. 12 August 2014. Retrieved 24 September 2014. ^ "Captain Who Fled South Korea Ferry Faces Murder Charge". Reuters. NBC News. 15 May 2014. Retrieved 24 September 2014. ^ a b "Crew of Doomed Sewol Ferry Goes on Trial in South Korea". Reuters. NBC News. 10 June 2014. Retrieved 24 September 2014. ^ Kim, Jack (28 April 2015). "S.Korea court finds ferry captain guilty of homicide for 304 deaths". Reuters. Thomson Reuters. Retrieved 12 June 2016. ^ <여객선 침몰>승선자 476명, 구조자 174명으로 정정 [Ferry Capsizing – The number of people on board and rescuers changed to 476 and 174]. Yonhap News (in Korean). Yonhap. 18 April 2014. Retrieved 20 May 2014. ^ Kim, Bong-Moon; Choi, Jong-Kwon (9 May 2014). "New updates made to total Sewol figures". Korea JoongAng Daily. JoongAng Ilbo. Retrieved 20 May 2014. ^ a b Kim, Jung-eun (28 July 2014). "Student survivors of Sewol ferry disaster testify at South Korea murder trial". CNN. Turner Broadcasting System. Retrieved 25 August 2014. ^ Kim, Se-jeong (17 February 2016). "Parents clash over Danwon classrooms". The Korea Times. Retrieved 17 June 2016. ^ "(3rd LD) All-out efforts to search sunken ferry continue amid weak currents". Yonhap. 7 May 2014. Retrieved 7 May 2014. ^ [세월호 참사]세월호 '미스터리'-세모해운의 후신? [Sewol Disaster: MV Sewol 'Mystery' – Semo Shipping Company's future?]. NEWSis (in Korean). 19 April 2014. Retrieved 1 May 2014. ^ "Sewol". Equasis (free registration required). French Ministry for Transport. Retrieved 25 November 2017. ^ Jack Kim, Choonsik Yoo (16 April 2014). "More than 300 people missing after South Korea ferry sinks – coastguard". Reuters. Retrieved 20 April 2014. ^ Kim, Sam (21 April 2014). "Two Hours Turn Class Trip into Shipwreck Horror for South Korea". Bloomberg. Retrieved 7 June 2014. ^ a b "Tycoon wanted in fatal South Korean boat capsize found dead". South Korea News.Net. Archived from the original on 28 July 2014. Retrieved 23 July 2014. ^ Park, Madison; Hancocks, Paula (16 April 2015). "Sewol ferry disaster: One year on, grieving families demand answers". CNN. Retrieved 15 July 2015. ^ "Fishermen Rescued Half the Survivors of Ferry Disaster". The Chosun Ilbo. Chosun.com. 30 April 2014. Retrieved 21 August 2015. ^ "Duty and Shame as the Ship Sank". The New York Times. 22 April 2014. ^ "South Korea cracking down on operator in Sewol ferry disaster; CEO arrested". CNN. 8 May 2014. ^ "South Korea's Leader and Media Face Scrutiny Over Ferry Disaster". The New York Times. 9 May 2014. ^ a b "Four crew members of sunken South Korea ship charged with murder". Asia Bulletin. Archived from the original on 5 June 2014. Retrieved 17 May 2014. ^ "Greed Was Biggest Culprit in Ferry Disaster". The Chosun Ilbo. Chosun.com. 6 May 2014. Retrieved 3 October 2014. ^ a b Kwon, Judy; Lah, Kyung (27 April 2014). "Ferry disaster's toll on South Korea's national psyche". CNN. Turner Broadcasting System. Retrieved 3 October 2014. ^ "Sunken ferry once plied Japan's seas". The Japan Times. 17 April 2014. Retrieved 18 February 2017. ^ a b McCurry, Justin (11 November 2014). "South Korea ferry verdict: Sewol captain sentenced to 36 years in prison". The Guardian. Guardian News and Media. Retrieved 21 November 2014. ^ Suh, Jae-Jung (22 September 2014). "South Korea: Still Stonewalling About the Sewol". Foreign Policy in Focus. Institute for Policy Studies. Retrieved 18 February 2017. ^ a b c 檢 세월호 수사결과 발표 "세월호는 과적 상태에서 급선회하다 침몰" [Presents MV Sewol investigation results "MV Sewol capsized due to sudden turn while overloaded]. The Chosun Ilbo (in Korean). Chosun.com. 6 October 2014. Retrieved 6 October 2014. ^ Kim, Suk-kyoon (11 November 2015). "The Sewol Ferry Disaster in Korea and Maritime Safety Management". Ocean Development and International Law. 46 (4): 345–358. doi:10.1080/00908320.2015.1089748. ^ Choe, Sang-hun (6 May 2014). "4 Employed by Operator of Doomed South Korean Ferry Are Arrested". The New York Times. The New York Times Company. Retrieved 18 February 2017. ^ Kwon, K.J. ; Yan, Holly (9 July 2014). "Report: S. Korean ferry operators prioritized profits over safety". CNN. Turner Broadcasting System. Retrieved 25 August 2014. ^ a b "Sewol Operator Routinely Overloaded Ferry". The Chosun Ilbo. Chosun.com. 7 May 2014. Retrieved 3 October 2014. ^ "Hopes fade of finding Sewol survivors". The Jeju Weekly. 21 April 2014. Retrieved 3 October 2014. ^ Hannemann, Olaf. "OpenSeaMap – The free nautical chart". OpenSeaMap. Retrieved 24 April 2014. ^ a b "Irregularities, Incompetence Led to Ferry Disaster". The Chosun Ilbo. Chosun.com. 24 April 2014. Retrieved 4 October 2014. ^ "Sewol disaster: South Korea to pay nearly $400,000 per student killed". BBC. 1 April 2015. Retrieved 2 March 2017. ^ Kim, Oi-hyun; Seo, Young-ji (18 April 2014). "3 foreign nationals among the missing from sunken ferry". The Hankyoreh. Retrieved 4 October 2014. ^ "South Korea Sewol ferry crew go on trial". BBC. 10 June 2014. Retrieved 4 October 2014. ^ Kwaak, Jeyup (30 April 2014). "South Korean Ferry Official Warned of Stability Issues". The Wall Street Journal. Dow Jones & Company. Retrieved 15 September 2014. ^ Villapaz, Luke (17 April 2014). "Who Is Lee Joon-Seok? South Korean Ferry Captain Apologizes And Faces Criminal Investigation For Sewol Sinking [PHOTO]". International Business Times. IBT Media. Retrieved 4 October 2014. ^ "The captains of the Sewol, the Samho Jewelry, and the Titanic". The Dong-a Ilbo. donga.com. 23 April 2014. Retrieved 4 October 2014. ^ <세월호참사> 승무원 탈출 전 선사와 통화…승무원 명단 누락(종합2보) [MV Sewol Disaster – Steward calls higher ranked member before escaping... crew list missing] (in Korean). Yonhap. 29 April 2014. Retrieved 25 August 2014. ^ Jun (전), Jong-hyue (종휘) (24 June 2014). ‘생명·안전 분야’ 비정규직 금지 눈길 ['Life and safety areas' hints of banning irregulars] (in Korean). The Hankyoreh. Retrieved 4 October 2014. ^ Jenkins, Nash (9 July 2014). "South Korean Ferry Was Operating Illicitly, State Report Says". TIME. Retrieved 21 February 2017. ^ Jo (조), Seong-eun (성은) (23 April 2014). [세월호 침몰 참사-단독] "배 떨림 너무 심하다" 문제 제기… 회사측 해고 협박 [MV Sewol Capsizing Disaster – Exclusive: "Ship vibration is too much" problem raised... company threatens to fire] (in Korean). KUKINEWS. Retrieved 4 October 2014. ^ Choi, He-suk (23 April 2014). "[Ferry Disaster] More irregularities emerge as Sewol death toll hits 139". The Korea Herald. Herald Corporation. Retrieved 4 October 2014. ^ "South Korean ferry captain says he warned of boat's stability problems". The Daily Telegraph. Telegraph Media Group. 30 April 2014. Retrieved 21 February 2017. ^ Choe, Sang-hun; Fackler, Martin; Cowan, Alison Leigh; Sayare, Scott (26 July 2014). "In Ferry Deaths, a South Korean Tycoon's Downfall". The New York Times. The New York Times Company. Retrieved 4 October 2014. ^ McCurry, Justin (20 April 2014). "South Korea ferry disaster: third mate 'steering in tricky waters for first time'". The Guardian. Retrieved 7 March 2017. ^ Park (박), Sang-soo (상수) (15 May 2014). "[세월호 참사]합수부 공소장으로 본 세월호 침몰" [[The Disaster of MV Sewol] The Sinking of the Sewol seen through the petition of appeal of the Coalition Investigation Team]. Newsis. Retrieved 5 March 2017. ^ a b Jang, Jung-min; Park, Ju-min (18 April 2014). "Vice-principal of South Korea school in ferry disaster commits suicide". Reuters. Thomson Reuters. Retrieved 28 February 2017. ^ "South Korea ferry disaster: What we know about Sewol's sinking". Australian Broadcasting Corporation. 24 April 2014. Retrieved 28 February 2017. ^ "South Korea ferry 'steered by inexperienced third mate'". BBC. 20 April 2017. Retrieved 28 February 2017. ^ Park, Madison (15 May 2014). "What went wrong on Sewol?". CNN. Turner Broadcasting System. Retrieved 3 October 2014. ^ "Did Sewol 3rd Mate Lie to Rescue Services?". The Chosun Ilbo. Chosun.com. 21 April 2014. Retrieved 28 February 2017. ^ Choi, He-suk (22 April 2014). "[Ferry Disaster] Death toll surpasses 150 as Sewol search speeds up". The Korea Herald. Herald Media. Retrieved 5 October 2014. ^ McCurry, Justin (16 April 2014). "South Korea ferry disaster survivors describe chaotic scenes". The Guardian. Guardian News and Media. Retrieved 5 October 2014. ^ Bae (배), Dong-min (동민) (13 October 2014). '평화로운 아침' 세월호 침몰 전 내부 모습 공개 ['Peaceful morning' MV Sewol's inner settings before the capsizing revealed]. NEWSis (in Korean). Newsis.com. Retrieved 21 October 2014. ^ "S Korea ferry survivor 'haunted' by memory of trapped students". BBC. 23 April 2014. Retrieved 5 March 2017. ^ a b c "기억을 건지다…6개월의 재판 기록" [Rescuing memory... 6 months' worth of court record]. Korean Broadcasting System. Retrieved 5 March 2017. ^ a b c Yang (양), Sung-mo (성모) (13 April 2015). "[디·퍼] 9시 26분 어떤 일이?…세월호 재판 6개월의 기록" [[Digital First] What happened on 9:26?... Six months' worth of court records in the Sewol Trial]. Korean Broadcasting System. Retrieved 7 March 2017. ^ a b 세월호 조타실 변침 방향은 오른쪽? 왼쪽? [Was the MV Sewol's steering room turning direction to the right? left?] (in Korean). The Hankyoreh. 12 September 2014. Retrieved 7 March 2017. ^ Wook (욱), Huh (허) (16 September 2014). 검경합수본 자문단장 "세월호 운행 불가능한 배"(종합) [Head of the expert advisory board for the police-prosecution joint investigation board "MV Sewol was a ship impossible to sail" (Compiled)] (in Korean). AsiaToday. Retrieved 6 October 2014. ^ a b 자문단장 "끊어진 세월호 AIS 36초, 시스템 한계 탓" [Head of advisory panel [said] "36 seconds of lost data of the AIS on the Sewol, is due to system limitations] (in Korean). Seoul Broadcasting System. 16 September 2014. Retrieved 6 October 2014. ^ Choi, He-suk (22 April 2014). "[Ferry Disaster] Death toll surpasses 150 as Sewol search speeds up". The Korea Herald. Herald Media. Retrieved 6 October 2014. ^ Nam, Hyun-woo (22 April 2014). "More questions arise for cause". The Korea Times. Retrieved 6 October 2014. ^ Cho (조), Im-song (임성) (6 October 2014). "세월호 폭침설·국정원 개입설 등 사실무근". YTN. Retrieved 20 October 2014. ^ a b Jung (정), Dae-ha (대하); Park (박) (16 September 2014). “세월호 침몰 주요 원인은 과적” 전문가 증언 [MV Sewol's main reason for capsizing is overloading" expert testifies] (in Korean). The Hankyoreh. Retrieved 6 October 2014. ^ a b <세월호, 4월 16일 08:49 초당 15도 급선회 실상은> [MV Sewol's was turning at 15 degrees per second on 16 April at 8:49] (in Korean). Yonhap. 16 September 2014. Retrieved 6 October 2014. ^ Choi, Hye-jin (16 September 2014). “세월호, 대각도로 방향 바꾸다 화물 쏠려 침몰” [MV Sewol capsized as the cargo shifted to one side following a large angular turn] (in Korean). Korean Broadcasting System. Retrieved 6 October 2014. ^ a b Hancocks, Paula; Shoichet, Catherine E.; Pearson, Michael (17 April 2014). "South Korean shipwreck survivors: Passengers told 'don't move' as ship sank". CNN. Retrieved 17 April 2014. ^ 세월호 45도 급선회...사라졌던 3분36초간의 기록 [MV Sewol Sudden turn of 45 degrees... the records of 3 minutes and 36 seconds that have disappeared]. Yonhap (in Korean). Naver Corporation. 22 April 2014. Retrieved 13 November 2014. ^ a b Park (박), So-hee (소희) (1 October 2014). 입 연 세월호 기관장 "죽을죄를 지었습니다" [The Chief Engineer of MV Sewol who opened his mouth "I committed a crime punishable by death"] (in Korean). OhmyNews. Retrieved 4 November 2014. ^ a b c Choe, Sang-hun; Kirk, Semple; Lee, Su-hyun (20 April 2014). "Errors Mounted as Chaos Ruled Capsizing Ferry". The New York Times. The New York Times Company. Retrieved 15 October 2014. ^ Kang, Jin-kyu (25 September 2014). "Simulations show far different fate for the Sewol". Korea JoongAng Daily. JoongAng Ilbo. Retrieved 15 October 2014. ^ McCurry, Justin (20 April 2014). "South Korea ferry disaster: third mate 'steering in tricky waters for first time'". The Guardian. Retrieved 22 April 2014. ^ Jang, Jung-min; Park, Ju-min (18 April 2014). "S.Korea ferry captain rushed back to bridge as ship listed – crewman". Reuters. Retrieved 20 October 2014. ^ a b Kim (김), Do-gyun (도균) (22 April 2014). 엔진 꺼진 채 표류하다 침몰...선장이 "꺼라" 지시 [[The ship] drifted with engines off and capsized... Captain ordered 'off'] (in Korean). Seoul Broadcasting System. Retrieved 28 October 2014. ^ "Sewol's captain under fire for fleeing sinking ship". The Hankyoreh. 18 April 2014. Retrieved 28 October 2014. ^ Choi (최), Chi-bong (치봉) (16 May 2014). 20대 女항해사, 배 가라앉는데 한쪽 구석에서... [As the ship was sinking, the female third mate in her 20s in the corner was...] (in Korean). Seoul Shinmun. Retrieved 4 November 2014. ^ "South Korea Sewol ferry: What we know". BBC. 15 May 2014. Retrieved 2 September 2014. ^ Kim, Jung-eun (28 July 2014). "Student survivors of Sewol ferry disaster testify at South Korea murder trial". CNN. Turner Broadcasting System. Retrieved 3 September 2014. ^ Park, Madison (18 April 2014). "Ferry accident: Woman, 71, survives because stranger wouldn't give up on her". CNN. Turner Broadcasting System. Retrieved 21 November 2014. ^ Hancocks, Paula; Shoichet, Catherine E.; Pearson, Michael (17 April 2014). "South Korean shipwreck survivors: Passengers told 'don't move' as ship sank". CNN. Turner Broadcasting System. Retrieved 21 November 2014. ^ Bacon, John (2 May 2014). "Heartbreaking video shows students as ferry sinks". USA Today. Gannett Company. Retrieved 11 November 2014. ^ 세월호 카톡 공개 "다들 사랑해. 진짜 사랑하고 마지막 동영상 찍었어" 눈물 [MV Sewol's Katalk reveal "I love everyone. I really love everyone and I took the last video" tears.] (in Korean). Seoul Broadcasting System. 16 July 2014. Retrieved 21 November 2014. ^ Stevens, Andrew (27 April 2014). "South Koreans mourn teen hero who made first emergency call from ferry". CNN. Turner Broadcasting System. Retrieved 3 September 2014. ^ Choi, He-suk (25 April 2014). "[Ferry Disaster] Sewol search turns increasingly grim". The Korea Herald. Herald Corporation. Retrieved 29 April 2014. ^ Kang, Jin-kyu (30 April 2014). "Videos at ferry disaster give glimpses of doom". Korea Joongang Daily. JoongAng Ilbo. Retrieved 14 November 2014. ^ a b c Noh, Hyun-woong (7 October 2014). "More stunning evidence of government incompetence in Sewol's "golden moments"". The Hankyoreh. Retrieved 14 November 2014. ^ a b c d e Lee, Kyung-mi; Kim, Young-dong (24 April 2014). "Student made first call for rescue from sinking Sewol ferry". The Hankyoreh. Retrieved 29 April 2014. ^ "Lost at sea". The Economist. 26 April 2014. Retrieved 14 November 2014. ^ Choe, Sang-hun (30 April 2014). "'Mom, This Looks Like the End of Me': Doomed Vessel's Last Minutes". The New York Times. The New York Times Company. Retrieved 14 November 2014. ^ a b "Transcript of conversation between sinking ferry, traffic control". CNN. 19 April 2014. Retrieved 20 April 2014. ^ [세월호 참사 / 승객들의 SNS·동영상] 청해진해운·세월호, 침몰中 7차례나 통화… 승객 구호·퇴선 지시 없었으면 사법 처리 [[MV Sewol Disaster / Passengers' SNS Video] Chonghaejin Marine MV Sewol, Spoke to Each Other 7 Times During the Capsizing... If there were no orders to make passengers abandon ship, it goes under judicial law]. The Chosun Ilbo (in Korean). Chosun.com. 30 April 2014. Retrieved 24 September 2014. ^ "Transcript Shows Urgent Calls to Help Sinking South Korean Ferry". The Wall Street Journal. Dow Jones & Company. 21 April 2014. Retrieved 16 November 2014. ^ a b c d <여객선침몰> 마지막 교신 "좌현 60도, 이동 쉽지 않다" [Ferry Capsizing – Last contact: "The ferry is tilted 60 degrees to the left, moving will not be easy"]. Yonhap News (in Korean). Yonhap. 20 April 2014. Retrieved 20 April 2014. ^ Wong, Gillian; Kim, Hyung-Jin (20 April 2014). "Confusion Over Ferry Evacuation May Have Added to Death Toll". ABC News. Retrieved 22 April 2014. ^ a b c Sang-hun, Choe; Lee, Su-hyun; Ham, Ji-ha (17 April 2014). "Human Error Suspected as Hope Fades in Korean Ferry Sinking". The New York Times. Retrieved 20 April 2014. ^ Lee, Youkyung; Klug, Foster (18 April 2014). "Transcript shows ferry captain delayed evacuation". Yahoo! News. Associated Press. Retrieved 15 September 2014. ^ 세월호는 완전 침몰 임박...해상 크레인 현장 도착 [Sewol's capsizing imminent... marine crane arrives to the scene] (in Korean). Seoul Broadcasting System. 18 April 2014. Retrieved 18 April 2014. ^ 세월호 수면 아래로 완전 침몰(속보) [Sewol completely submerged (Breaking news)]. Yonhap News (in Korean). Yonhap. 18 April 2014. Retrieved 18 April 2014. ^ Park, Ju-min (2 September 2014). "Crew of doomed South Korea ferry drank beer while awaiting rescue: media". Reuters. Thomson Reuters. Retrieved 15 September 2014. ^ Park, Ju-min (17 June 2014). "Accused South Korea ferry crew say rescue was coastguard's job". Reuters. Thomson Reuters. Retrieved 15 September 2014. ^ Ryall, Julian (15 May 2014). "South Korea ferry captain charged with manslaughter". Telegraph Media Group. Retrieved 15 September 2014. ^ "Coast Guard Gave Special Treatment to Ferry Captain". The Chosun Ilbo. Chosun.com. 2 May 2014. Retrieved 17 September 2014. ^ a b Kang, Jin-kyu (30 April 2014). "Videos at ferry disaster give glimpses of doom". JoongAng Ilbo. Retrieved 17 September 2014. ^ "South Korea ferry: Students 'floated from cabins'". BBC. 28 July 2014. Retrieved 17 September 2014. ^ a b Hayashi, Yuka; Nam, In-soo; Martin, Alexander; Pfanner, Eric; Lee, Min-jeong (18 April 2014). "As South Korean Ferry Disaster Unfolded, Anguished Final Goodbyes". The Wall Street Journal. Dow Jones & Company. Retrieved 24 September 2014. ^ Hancocks, Paula; Shoichet, Catherine E.; Pearson, Michael (17 April 2014). "South Korean shipwreck survivors: Passengers told 'don't move' as ship sank". CNN. Turner Broadcasting System. Retrieved 17 September 2014. ^ a b Robertson, Nic; Fantz, Ashley; Shoichet, Catherine (14 May 2014). "Videos capturing ferry's final moments fuel fresh outrage over ship's fate". CNN. Turner Broadcasting System. Retrieved 17 September 2014. ^ a b Choe, Sang-hun (30 April 2014). "'Mom, This Looks Like the End of Me': Doomed Vessel's Last Minutes". The New York Times. The New York Times Company. Retrieved 17 September 2014. ^ a b Bacon, John (2 May 2014). "Heartbreaking video shows students as ferry sinks". USA Today. Gannett Company. Retrieved 17 September 2014. ^ Bak (백), Seung-mok (승목) (16 April 2014). [단독]"엄마, 내가 말 못할까봐…사랑한다" 침몰 배 탑승 학생의 문자메시지 [[Exclusive]"Mom, just in case I can't say it... I love you" Student's Text Message During the Capsizing Ship] (in Korean). Kyunghyang Shinmun. Retrieved 17 September 2014. ^ "SNS Messages Become Precious Clues in Korean Ferry Disaster". Business Korea Co., Ltd. 23 April 2014. Archived from the original on 4 October 2014. Retrieved 17 September 2014. ^ <여객선침몰> 경찰 "SNS '살아 있다' 메시지 전부 가짜"(종합) [Ferry capsizing – Police say the "SNS 'I'm alive' messages are all fake" (Compiled)]. Yonhap News (in Korean). Yonhap. 17 April 2014. Retrieved 18 April 2014. ^ Cha, Frances (18 April 2014). "South Korea ferry disaster: Fake survivor posts add to nation's anguish". CNN. Turner Broadcasting System. Retrieved 17 September 2014. ^ Cho, Chung-un (16 May 2014). "[Weekender] 'Sewol disaster reveals failure of mass media as watchdog'". The Korea Herald. Herald Corporation. Retrieved 29 September 2014. ^ Min, Yong-jun (17 April 2014). "죽은 언론의 사회". The Huffington Post. Retrieved 29 September 2014. ^ Nam, In-soo (16 May 2014). "Media Outlets Apologize Over Sewol Ferry Disaster Coverage". The Wall Street Journal. Dow Jones & Company. Retrieved 29 September 2014. ^ Cain, Geoffrey (20 August 2014). "After Sewol Ferry Disaster, Koreans Lower Trust in Government". NBC News. Retrieved 29 September 2014. ^ <여객선침몰> 해군 승조원들 '구명조끼' 던져주며 구조 [Ferry Capsizing: Navy sailors rescue by throwing life jackets] (in Korean). Yonhap. 16 April 2014. Retrieved 21 April 2014. ^ 452명 탄 여객선 진도 해상서 침몰中...110명 구조 [A ferry with 452 people capsizing near Jindo coast... 110 people rescued]. Yonhap News (in Korean). 16 April 2014. Retrieved 21 April 2014. ^ "Senior Coast Guard official arrested over Sewol ferry sinking". Yonhap. 29 July 2014. Retrieved 22 September 2014. ^ a b c d ‘첫출동’ 해경 경비정, 세월호와 교신 못한 채 사고해역 도착 ['First dispatch' Coast Guard Patrol Vessel, Arrived at Accident Scene Without Communicating with MV Sewol] (in Korean). dongA.com. 28 April 2014. Archived from the original on 6 October 2014. Retrieved 29 September 2014. ^ Sa (사), Jung-won (정원) (28 April 2014). "해경 123정 "세월호 승객 향해 '탈출하라' 방송"". KBS. Retrieved 29 September 2014. ^ a b "Footage Reveals Half-Hearted Rescue Efforts in Ferry Disaster". The Chosun Ilbo. Chosun.com. 29 April 2014. Retrieved 22 September 2014. ^ <여객선침몰> 해수부, 해양사고 '심각' 경보 발령(종합) [Ferry Capsizing: Ministry of Oceans and Fisheries, declared the naval accidental state 'grave']. Yonhap News (in Korean). 16 April 2014. Retrieved 21 April 2014. ^ <여객선침몰> 복지부, 재난의료지원팀 급파 [Ferry Capsizing: Ministry of Health and Welfare, quickly dispatched the Disaster Medical Support Team]. Yonhap News (in Korean). 16 April 2014. Retrieved 21 April 2014. ^ 여객선 침몰 대비...수중구조 해군SSU 투입(속보) [Preparing for the capsizing of the ferry... sea rescue operations navy unit SSU deployed]. Yonhap News (breaking news) (in Korean). 16 April 2014. Retrieved 25 April 2014. ^ <여객선침몰> 육군 특전사 150명·해군 구조대 196명 투입 [Ferry Capsizing: 150 Army Special Warfare Command units 196 Navy rescuers sent for operations]. Yonhap News (in Korean). 16 April 2014. Retrieved 27 April 2014. ^ <여객선침몰> 경기도 재난안전대책본부 가동 [Ferry Capsizing: Gyeonggi-do starts operating the Prevention and Countermeasures Headquarters]. Yonhap News (in Korean). 16 April 2014. Retrieved 27 April 2014. ^ 고교생 등 477명 탄 여객선 침몰...290명 생사불명 [A ferry with 477 people, including high school students capsize... 290 missing]. Yonhap News (in Korean). 16 April 2014. Retrieved 27 April 2014. ^ <여객선침몰> 경기교육청 종합상황본부 확대 설치 [Ferry Capsizing: The Gyeonggi-do Office of Education establishes the Accident Countermeasures Report Compiling Headquarters]. Yonhap News (in Korean). 16 April 2014. Retrieved 27 April 2014. ^ 침몰 여객선 선체 수색 중단...17일 새벽 재개키로 [The hull investigations of the capsized ferry stopped... Operations planned to begin again on the morning of the 17th]. Yonhap news (in Korean). 16 April 2014. Retrieved 27 April 2014. ^ Kim (김), JongWon (종원) (16 April 2014). [진도 여객선 침몰] 군·해경 선체수색 나섰지만 안타깝게... [Jin-do ferry capsize: Military, navy went to investigate but regretfully...]. Asia Today (in Korean). Retrieved 17 April 2014. ^ Withnall, Adam (26 May 2014). "South Korea ferry disaster: Civilian divers scouring the Sewol wreckage are being 'paid by the body', presidential office suggests". The Independent. Independent Print Limited. Retrieved 25 September 2014. ^ a b Choi, He-suk (30 April 2014). "[Newsmaker] Rescue firm blamed for favoritism, slow work". The Korea Herald. Herald Corporation. Retrieved 25 September 2014. ^ <여객선침몰> 조명탄 쏘며 선체 수색 재개 [Ferry Capsizing – Hull investigations begin again while shooting flares]. Yonhap News (in Korean). Yonhap. 17 April 2014. Retrieved 27 April 2014. ^ a b Kim (김), HanSik (한식); Kim (김), TaeSung (태성); Bak (박), JunBae (준배); Kim (김), Ho (호) (17 April 2014). 오전 7시 수색 개시...사망자 6명 모두 신원 확인(종합) [Start Investigation at 7 am... all six deaths identified] (in Korean). News1 Korea. Retrieved 17 April 2014. ^ Kang, Jin-kyu (2 May 2014). "Navy's divers grounded day after ferry accident". Korea JoongAng Daily. JoongAng Ilbo. Retrieved 25 September 2014. ^ <여객선침몰> 다이버 등 민간단체 수색·구조에 동참 [Ferry Capsizing – Civilian groups such as divers help in the search/rescue operations]. Yonhap News (in Korean). Yonhap. 17 April 2014. Retrieved 27 April 2014. ^ Ahn, Kwan-ok (17 April 2014). "Hundreds missing in tragic ferry sinking". The Hankyoreh. Retrieved 25 September 2014. ^ "(3rd LD) Nearly 300 still missing in ferry disaster". Yonhap. 17 April 2014. Retrieved 25 September 2014. ^ <여객선침몰> "야속한 하늘이여" 기상악화로 수색중단 [Ferry Capsizing – "The cruel sky" Search operations stopped due to worsening weather conditions] (in Korean). 17 April 2014. Retrieved 27 April 2014. ^ Song, Su-hyun (19 April 2014). "Massive marine cranes arrive to aid rescue efforts". Korea JoongAng Daily. JoongAng Ilbo. Retrieved 25 September 2014. ^ 중대본 "오전 10시50분부터 선체로 공기주입 시작"(속보) [Central Disaster Headquarters [say] "Started pumping air inside the ship on 10:50 am"(Breaking news)] (in Korean). Yonhap. 18 April 2014. Retrieved 26 September 2014. ^ Moore, Malcolm (18 April 2014). "South Korean ferry disaster: Captain 'abandoned ship while passengers told to stay below'". The Telegraph. Telegraph Media Group. Retrieved 25 September 2014. ^ Jang, Jung-min; Park, Ju-min (18 April 2014). "S.Korea ferry captain rushed back to bridge as ship listed – crewman". Reuters. Thomson Reuters. Retrieved 25 September 2014. ^ [속보] 중대본, 선내 진입 성공→실패로 정정 [Breaking News: Central Disaster Countermeasure Headquarters, change investigations inside from success to failure] (in Korean). YTN. 18 April 2014. Retrieved 28 April 2014. ^ Choi, He-suk (20 April 2014). "[Ferry Disaster] Navy sailor dies from injury sustained while supporting Sewol rescue". The Korea Herald. Herald Corporation. Retrieved 29 September 2014. ^ <세월호참사> 침몰 7일째 무인탐사기 '게 로봇' 투입 [Sewol Disaster: On the 7th day of the capsizing, unmanned search devices 'Crabster robot' added to operations]. Yonhap News (in Korean). 22 April 2014. Retrieved 30 April 2014. ^ "CR2000 'Crabster' at Sewol Sinking Site". Yahoo News. Yahoo!. Retrieved 26 September 2014. ^ Kwaak, Jeyup S. (6 May 2014). "Diver's Death in Ferry Search Highlights Difficulties". The Wall Street Journal. Dow Jones & Company. Retrieved 29 September 2014. ^ "South Korean diver dies during ferry search". Al Jazeera. Agence France-Presse. 6 May 2014. Retrieved 6 May 2014. ^ "South Korea ferry search diver dies". Agence France-Presse. The Guardian. 30 May 2014. Retrieved 29 September 2014. ^ Kwon, KJ; Smith-Spark, Laura (17 July 2014). "Sewol ferry search helicopter crash kills 5 in South Korea". Retrieved 25 September 2014. ^ "Firefighting helicopter crashes in South Korea, killing 5". Fox News Channel. Associated Press. 17 July 2014. Retrieved 29 September 2014. ^ "South Korea approve plans to salvage sunken ferry". The Big Story. Retrieved 22 April 2015. ^ a b Yu (유), Sung-hae (성해) (21 May 2014). "세월호 '학생 전원 구조' 최초 오보는 MBC"... 왜? ["MV Sewol 'All Students Rescued' First Misreport made by MBC"... Why?] (in Korean). OhmyNews. Retrieved 29 September 2014. ^ "Ferry Tragedy Could Have Been Avoided". The Chosun Ilbo. Chosun.com. 17 April 2014. Retrieved 29 September 2014. ^ Sridharan, Vasudevan (16 April 2014). "South Korea Ferry Tragedy: US Amphibious Assault Vessel to Join Rescue Operation as 295 Remain Missing". International Business Times. ^ "Civilian Diver Dies Searching for Bodies From South Korea Ferry". Time. 6 May 2014. ^ "Two people dead, 290 missing in sunken ferry". Yonhap News Agency. 16 April 2014. ^ "Ferry sinking off South Korean coast, over 470 people on board". RT. 16 April 2014. ^ Kwon (권), KyungAhn (경안); Kim (김), HyungWon (형원) (17 April 2014). 침몰까지 140分... 눈뜨고 아이들 잃는 나라 [140 Minutes to campsizing... A country that loses children while staring]. The Chosun Ilbo (in Korean). ^ "South Korean shipwreck survivors: Passengers told 'don't move' as ship sank". CNN. 16 April 2014. ^ "(2nd LD) Search resumes for missing in sunken ferry". Yonhap. 17 April 2014. Retrieved 17 April 2014. ^ 해경 무인로봇 동원 수색재개...사망자 14명으로 늘어 [Coast Guard restarts operations with unmanned robots... death counts increase to 14]. Yonhap News (in Korean). Yonhap. 17 April 2014. Retrieved 17 April 2014. ^ "S. Korea ferry sinking:Hundreds still missing (Updated Friday)". 18 April 2014. Retrieved 18 April 2014. ^ "Death toll in South Korean Ferry Tragedy reaches 36". Biharprabha. Indo-Asian News Service. Retrieved 19 April 2014. ^ "Divers comb sunken ferry after recovering 13 bodies from inside". Yonhap News Agency. 20 April 2014. Retrieved 19 April 2014. ^ "Number of Deaths in South Korean Ship Disaster reaches 64". Biharprabha. Indo-Asian News Service. Retrieved 20 April 2014. ^ "Diver searching sunken ferry off South Korea dies". CNN. Retrieved 6 May 2014. ^ "South Korean ferry disaster: Death toll rises to 275 as crews search frigid waters". CNN. Retrieved 10 May 2014. ^ "(3rd LD) Death toll from sunken ferry rises to 288". Yonhap News. 21 May 2014. Retrieved 23 May 2014. ^ "16 Ferry Disaster Victims Remain Missing". The Chosun Ilbo. Retrieved 23 May 2014. ^ Melissa Hellmann (6 June 2014). "Sewol: South Korea Ferry Tragedy Death Toll Climbs to 290". TIME. Retrieved 6 June 2014. ^ Kim, Bong-moon (7 June 2014). "One more body found in Sewol ferry search". JoongAng Daily. Koreajoongangdaily.joins.com. Retrieved 6 June 2014. ^ Park, Eun-jee (9 June 2014). "Teacher who saved students found within Sewol". Korea JoongAng Daily. Retrieved 9 June 2014. ^ "Teacher who saved students found within Sewol". Korea JoonAng Daily. Korea JoonAng Daily. 9 June 2014. Retrieved 6 September 2014. ^ "No progress in search for missing in ferry disaster for 15th day". English.yonhapnews.co.kr. Yonhap. 23 June 2014. Retrieved 23 June 2014. ^ "Another Sewol-ho ferry victim recovered, eleven still missing". Arirang.co.kr. 24 June 2014. Retrieved 24 June 2014. ^ "Badly decomposed body found in South Korea is fugitive ferry tycoon, say police". the Guardian. 22 July 2014. Retrieved 22 April 2015. ^ Hong, Gil-dong (18 April 2014). "Major disasters in Korea". The Korea Herald. Archived from the original on 12 June 2014. Retrieved 31 May 2014. ^ "Over 280 missing after South Korean ferry capsizes". Reuters. 16 April 2014. Archived from the original on 5 June 2014. ^ Rowland, Ashley (16 April 2014). 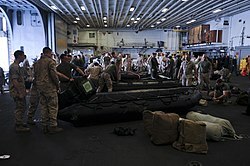 "USS Bonhomme Richard Heads to Capsized Korea Ferry". Stars and Stripes. Military. Retrieved 16 April 2014. ^ Wyllie, David (16 April 2014). "South Korea Ferry Sinking: U.S. Navy Ship to Join Rescue Effort". NBC News. Retrieved 16 April 2014. ^ 침몰 당시 구조하러 온 미군 헬기, 우리 군이 돌려보내. The Hankyoreh (in Korean). 18 April 2014. Retrieved 20 April 2014. ^ Rowland, Ashley (23 April 2014). "Navy recovery vessel USNS Safeguard en route to South Korea". Stars and Stripes. ^ "(LEAD) S. Korea readies 'diving bell' for search of sunken ferry". Yonhap News Agency. 30 April 2014. ^ 韓国「特段支援はいらない」...海保の申し出辞退. Yomiuri Shimbun (in Japanese). 18 April 2014. Retrieved 18 April 2014. ^ a b c d 세월호 사고원인 '변침' 잠정 결론...시간대별 구성 [Sewol's cause of accident 'sudden turn' is concluded to be the cause... timeline]. Kyunghyang Shinmun (in Korean). 17 April 2014. Retrieved 18 April 2014. ^ "Transcript Shows Ferry Captain Delayed Evacuation". NPR. 18 April 2014. Archived from the original on 20 April 2014. Retrieved 20 April 2014. ^ '세월호' 침몰, 급격한 방향전환이 원인으로 드러나 ['Sewol' capsizing: a sudden turn is revealed to be the cause]. Yonhap News (in Korean). 17 April 2014. Retrieved 17 April 2014. ^ a b 수사세월호 선원들 "변침 실수...복원력 부족했다" [Investigation: MV Sewol's crew "Mistake with the sudden turn... did not have enough restoring force"] (in Korean). Maeil Broadcasting Network. 22 April 2014. Retrieved 4 May 2014. ^ 물류팀 처벌 마무리·과적 직접 원인 가능성 [Finished prosecuting the distribution team; Finish and overloading viewed as direct causes] (in Korean). YTN. 4 May 2014. Retrieved 4 May 2014. ^ Campbell, Charlie (2 May 2014). "Reports: The South Korean Ferry Sank Because It Was Dangerously Overloaded". Time. Retrieved 4 May 2014. ^ Park, Eun-Jee (2 May 2014). "Doomed Sewol carried three times its cargo limit". Korea JoongAng Daily. JoongAng Ilbo. Retrieved 4 May 2014. ^ Bae, Ji-sook (20 April 2014). "Ferry Disaster: 'Overload, massive extension might have caused disaster'". The Korea Herald. Herald Corp. Retrieved 2 May 2014. ^ "South Korea Ferry Owners Ignored Warning About Stability Problems, Off-Duty Captain Says". Huffington Post. Associated Press. 30 April 2014. Retrieved 6 May 2014. ^ "Murder trial of Sewol captain begins in South Korea". wsws.org. 17 June 2014. Retrieved 23 June 2014. ^ "Greed Was Biggest Culprit in Ferry Disaster". Chosun Ilbo. 6 May 2014. Retrieved 6 May 2014. ^ a b "Captain and 3 Officers Charged With Murder in Korean Ferry Sinking". The New York Times. 16 May 2014. Retrieved 16 May 2014. ^ 세월호 참사로 본 해양업계 관행은? [공길영, 한국해양대 항해학부 교수] [Custom of the maritime industry as seen by the Sewol disaster? ―Gong Gil-young, a professor of Navigation at the Korea Maritime University] (in Korean). YTN. 3 May 2014. Retrieved 4 May 2014. ^ <세월호참사> 수사본부 '세월호 침몰 원인' 수사 집중 [MV Sewol Disaster: Investigations Headquarters focus investigations on the 'Cause of the MV Sewol Capsizing']. Yonhap News (in Korean). 3 May 2014. Retrieved 4 May 2014. ^ Kim (김), Ji Eun (지은) (18 April 2014). [진도 여객선 침몰 참사] 항로변경前 이미 선체 손상 가능성... 급선회하며 쏠림현상 겹친 듯 [Jin-do ferry capsizing: Before the turn, a possibility of prior structural damage... the sudden turn and the cargo piling appears to have combined] (in Korean). 인터넷한국일보. Archived from the original on 17 April 2014. Retrieved 18 April 2014. ^ 세월호, 기준치 3배 화물 실었다... 복원성 '상실' 가능성. Ohmy News. 22 April 2014. ^ Park, Chan-Kyong (29 April 2014). "Captain says warnings over Korean ferry ignored". Yahoo!. Agence France-Presse. Retrieved 4 May 2014. ^ 선박 내부 구조와 침몰 원인은? [공길영, 한국해양대 교수] [The inside structure of the ship and the cause of the capsizing? ―Kong Gil-Young, professor of the Korea Maritime University] (in Korean). YTN. 17 April 2014. Retrieved 18 April 2014. ^ [속보] 진도 여객선 침몰 이유? "안개 탓으로 암초 부딪혀..." [Breaking News: The cause of Jindo Ferry capsizing? "Due to the fog, the ferry hit a reef..."]. MBN News (in Korean). Maeil Broadcasting Network. 16 April 2014. Retrieved 19 April 2014. ^ Lee, Hyung Joo (형주) (17 April 2014). [단독]선장 "암초충돌 아니다... 원인 몰라" [Exclusive: Captain says "It's not a collision with a reef... don't know the cause"]. 동아일보 (in Korean). Dong A. Retrieved 19 April 2014. ^ Lee, Kyung Jin (경진) (17 April 2014). "진도 여객선 세월호 침몰 원인, 변침으로 잠정결론...'에어포켓만이 희망'" [The cause of the Jindo Ferry Sewol capsizing, temporarily concluded as a sudden turn... 'the only hope is air pockets']. TV Daily. Asia E. Retrieved 19 April 2014. ^ "Verkhoturov D. Korean Titanic: A Study of the Ferry Sewol Disaster". Amazon Digital Services LLC. 22 April 2018. ^ Lee, YouKyung; Klug, Foster (19 April 2014). "Captain of sunken SKorean ferry, 2 crew arrested". Yahoo!. Associated Press. Retrieved 15 May 2014. ^ Mullen, Jethro (23 April 2014). "Abandon ship? In recent maritime disasters, captains don't hang around". CNN. Retrieved 2 May 2014. ^ Drew, Christopher; Mouawad, Jad (19 April 2014). "Breaking Proud Tradition, Captains Flee and Let Others Go Down With Ship". The New York Times. Retrieved 20 April 2014. ^ 대한민국 선원법 [ROK Maritime Law concerning Sailors] (in Korean). 2008 – via Wikisource. ^ Choi, He-suk (20 April 2014). "[Ferry Disaster] Communications log shows gross negligence of crew". The Korea Herald. Retrieved 15 May 2014. ^ Park, Ju-Min (21 April 2014). "South Korea's Park says conduct of ferry crew tantamount to murder". Reuters. Retrieved 15 May 2014. ^ Kim, Hyung-Jin; Lee, YouKyung (26 April 2014). "Entire Crew That Navigated Sunken South Korean Ferry 'Sewol' Now in Custody". Huffington Post. Associated Press. Retrieved 15 May 2014. ^ Ryall, Julian (15 May 2014). "South Korea ferry captain charged with manslaughter". The Daily Telegraph. London. Retrieved 15 May 2014. ^ Kim, Sam (15 May 2014). "Korea Charges Four Crew Members of Sunken Ship With Homicide". Bloomberg Businessweek. Retrieved 15 May 2014. ^ "Prime Time News 22:00". 29 April 2014. Archived from the original on 17 May 2014. Retrieved 16 May 2014. ^ Per Liljas (23 April 2014). "South Korea Ferry Disaster: Heroes Among 'Sewol' Crew Praised". Time. Retrieved 21 May 2014. ^ "South Korea cracking down on operator in Sewol ferry disaster; CEO arrested". CNN. 8 May 2014. Retrieved 8 May 2014. ^ Kwaak, Jeyup S. (8 May 2014). "South Korean Prosecutors Arrest Chief Executive of Sewol Ferry Operator". The Wall Street Journal. Retrieved 15 May 2014. ^ "Ferry Owner's Children Go Underground". English.chosun.com. 13 May 2014. Retrieved 9 June 2014. 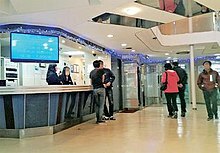 ^ "The Chosun Ilbo (English Edition): Daily News from Korea – Ferry Owner Summoned for Questioning". English.chosun.com. 14 May 2014. Retrieved 30 May 2014. ^ Kim, Connie (19 May 2014). "Speculation about Sewol-ho ferry owner's whereabouts rises again". Arirang News. Retrieved 27 May 2014. ^ Kim, Da-ye (14 May 2014). "Cult followers in standoff with prosecution". The Korea Times. Retrieved 30 May 2014. ^ "Ferry Owner's Son on Most-Wanted List". English.chosun.com. 15 May 2014. Retrieved 30 May 2014. ^ Hong, Gil-dong (14 May 2014). "Cult linked to ferry firm resists law". The Korea Herald. Retrieved 30 May 2014. ^ Hong, Gil-dong (20 May 2014). "Sewol owner may have fled church compound". The Korea Herald. Retrieved 30 May 2014. ^ Lee, Hyo-sik (22 May 2014). "Arrest warrant issued for Yoo". The Korea Times. Retrieved 22 May 2014. ^ Kim, Hyng-jin (23 May 2014). "Reward Offered for Missing South Korea Ferry Owner". Associated Press. Archived from the original on 6 June 2014. Retrieved 23 May 2014. ^ Lee, Hyo-sik (24 May 2012). "Cat-and-mouse game continues for Yoo clan". The Korea Times. Retrieved 25 May 2014. ^ Lee, Hyo-sik (25 May 2014). "Reward for Yoo raised 10-fold". The Korea Times. Retrieved 25 May 2014. ^ Winter, Michael (21 July 2014). "Body believed fugitive owner of sunken ferry". USA Today. Retrieved 21 July 2014. ^ Hong Gil-dong (3 June 2014). "Arrest warrants issued for two ship inspectors". Koreaherald.com. Retrieved 8 June 2014. ^ "South Korea ferry disaster: prosecutors seek death penalty for captain". the Guardian. 27 October 2014. Retrieved 22 April 2015. ^ Kim, Yon-se (5 November 2014). "Sewol owner's son gets three years in jail". Korea Herald. Korea Herald. Retrieved 5 November 2014. ^ "Ferry trial – Sewol captain sentenced to 36 years in jail". BBC News. 11 November 2014. Retrieved 12 November 2014. ^ "South Korea ferry boss jailed for 10 years over Sewol sinking". The Guardian. London. AP. 20 November 2014. Retrieved 13 May 2015. ^ Lee Kyung-min (28 April 2015). "Sewol captain gets life in prison". The Korea Times. Retrieved 29 April 2015. ^ "Sewol ferry: S Korea court gives captain life sentence for murder". BBC. 28 April 2015. Retrieved 29 April 2015. ^ Choe, Sang-hun (12 May 2015). "South Korean Court Lowers Jail Sentence of Ferry Company's Chief". New York Times. Retrieved 13 May 2015. 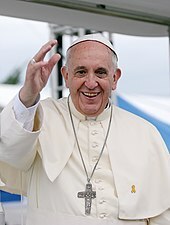 ^ "Pope expresses hope for a "moral rebirth" in South Korea". The Hankyoreh. 26 April 2014. ^ "Ferry Captain's Selfishness Raises Larger Questions". The Chosun Ilbo. 18 April 2014. ^ "Tragic ferry Sewol repeatedly overloaded: report". Daily News. New York. 4 May 2014. ^ "South Korea ferry disaster: Families' anger erupts". BBC News. 20 April 2014. ^ "South Korea ferry disaster: Distrust, anger over President's actions". The Straits Times. 2 May 2014. ^ "Ruling party lawmaker apologizes over son's Facebook posting". Yonhap News Agency. 21 April 2014. ^ "Prime Minister berated by families of Sewol victims". The Korea Herald. 18 April 2014. ^ "Grieving Parents Jeer South Korea's President at Ferry Memorial". NBC News. 30 April 2014. ^ "South Korea ferry victims' parents protest at presidential palace". The Telegraph. 9 May 2014. ^ "Obama offers condolences, White House magnolia tree to South Korea". The Washington Times. 25 April 2014. Retrieved 18 May 2014. ^ "Statement by the President on the Tragic Ferry Sinking Off the Coast of the Republic of Korea". The White House. 17 April 2014. ^ "Japan PM offers sympathy to South Korea ferry disaster victims". 17 April 2014. ^ Kim, Kwon Young (17 April 2014). <여객선침몰> 베트남 "인명피해에 깊은 애도" [Ferry capsizing: Vietnam, "Deep condolences over the lives lost"]. Yonhap News (in Korean). Retrieved 17 April 2014. ^ "PM Lee sends condolences to President Park on South Korea ferry disaster". The Straits Times. Retrieved 17 April 2014. ^ 习近平就韩国客轮沉没事故向韩国总统致慰问电 (in Chinese). Xinhua News Agency. 17 April 2014. Retrieved 17 April 2014. ^ "Xi Jinping Sends Message of Condolences to ROK President over Accident of the Sinking of the ROK Passenger Ship". Ministry of Foreign Affairs of the People's Republic of China. 17 April 2014. Retrieved 8 May 2014. ^ Pearson, Michael; Jiang, Steven; Stevens, Andrew (1 May 2014). "South Korean authorities search ferry owner's offices as probe widens". CNN. Retrieved 8 May 2014. ^ "South Korean prime minister resigns over ferry disaster response". CNN. 27 April 2014. ^ "South Korean president apologizes for response to ferry sinking". CNN. 29 April 2014. ^ "Editorial: What we really need is a "remodeling of the President"". The Hankyoreh. 30 April 2014. As expected, Park opted to apologize indirectly, at a Cabinet meeting, rather than facing the public directly. ^ "President's apology". The Korea Times. 29 April 2014. but not directly to the people, but in indirect ways like remarks in meetings with her aides. ^ "BBC News – South Korea to break up coastguard after ferry disaster". BBC. 1 January 1970. Retrieved 21 May 2014. ^ "South Korean president dismantles coast guard after ferry disaster". CNN.com. 18 May 2014. Retrieved 6 June 2014. ^ <여객선침몰> 청해진해운 김한식 대표 "죽을 죄 졌습니다"(종합) [Ferry capsizing: Representative of Cheonghaejin Marine Company, Kim HanSik, "I committed a crime worthy of death"]. Yonhap News (compiled) (in Korean). 17 April 2014. Archived from the original on 18 April 2014. Retrieved 18 April 2014. ^ Howard, Gary (28 April 2014). "KR chairman and ceo Chon Young-kee resigns over Sewol". Seatrade Global. Retrieved 2 May 2014. ^ "South Korean ferry victims' kin ask, 'How are we going to live now?'". CNN. Retrieved 24 April 2014. ^ Yan, Holly; Paula Hancocks (18 April 2014). "Police: Arrest warrant issued for captain, 2 crew members of sunken S. Korea ferry". CNN. Retrieved 18 April 2014. ^ "Ferry captain arrested in South Korea disaster defends evacuation delay". The Australian. 19 April 2014. Retrieved 19 April 2014. ^ "단원고등학교 교감 자살 "저승에서도 선생을 할까"". Chosun Ilbo. 19 April 2014. Retrieved 19 April 2014. ^ 노란리본달기 캠페인 "하나의 작은 움직임이 큰 기적을"...세월호 구조 염원 [Wear a yellow ribbon campaign "One small movement [hopefully] for a big miracle"... desire for rescue in the MV Sewol] (in Korean). Maeil Broadcasting Network. 22 April 2014. Retrieved 8 May 2014. ^ a b Suh, Ye-seul (23 April 2014). "[Ferry Disaster] Yellow ribbons carry hopes for miracle". The Korea Herald. Retrieved 8 May 2014. ^ Cheng, Jonathan (5 May 2014). "Children's Day Becomes Day of Grief". The Wall Street Journal. Retrieved 8 May 2014. ^ Mullen, Jethro (24 April 2014). "Ferry disaster: Yellow ribbons become symbol of hope, solidarity". CNN. Retrieved 8 May 2014. ^ "Celebrities show their respect for the Sewol ferry tragedy victims". allkpop. 16 April 2017. ^ "(Video) Sewol tribute song released". The Korea Herald. 7 April 2017. ^ god, '촛불하나'로 2만관객과 한마음 "세월호 참사 1000일 기억" (in Korean). jTBC. 9 January 2017. ^ Chang, Justin (6 October 2014). "Busan Film Review: 'The Truth Shall Not Sink With Sewol'". Variety. Retrieved 16 October 2014. ^ 우리 방식대로 1000만 가자! 한국 다큐, 다시 세월호를 말하다 [Hoping for 10 million views! Korean documentary, sheds new light on the sinking of Sewol ferry] (in Korean). OhmyNews. 5 September 2015. Retrieved 19 July 2016. ^ Film points finger at South Korean government for Sewol disaster, BBC News, 23 April 2017. ^ Jin-man, Lee (17 April 2015). "Participants hold electronic candles to form the shape of the Sewol ferry". Yahoo! Celebrity, India. Archived from the original on 19 June 2015. Retrieved 5 February 2018. ^ "[Photo] Guinness record-setting candlelight vigil : National : News : The Hankyoreh". English.hani.co.kr. 18 April 2015. Retrieved 24 March 2017. ^ 전주신흥고등학교 학생회 세월호 참사 4주기 추모 행사. 전북도민일보 (in Korean). 19 April 2018. Retrieved 18 October 2018. ^ 광주일고 3학년 English Together(2018) : 네이버 카페. café.naver.com (in Korean). Retrieved 18 October 2018. ^ "South Korea begins operations to recover sunken Sewol ferry". CNN. 22 March 2017. ^ Marex (6 September 2017). "Chinese Company Picked to Salvage Sewol". Maritime Executive. Retrieved 31 January 2018. ^ "Sewol ferry salvage animation video". CGTN. 25 March 2017. Retrieved 31 January 2018. ^ "Sewol finally brought ashore". Maritime Journal. 5 May 2017. Retrieved 31 January 2018. ^ "Load-in of Sewol ferry completed in East China Sea". Safety4Sea. 16 June 2017. Retrieved 31 January 2018. ^ "South Korea ferry disaster: Sewol remains 'not human'". BBC News. 27 March 2017. Retrieved 27 March 2017. ^ "Search team identifies missing student's remains in Sewol ferry". The Korea Herald. 14 May 2017. ^ "Remains found in Sewol-ho ferry confirmed as missing passenger Lee". Arirang News. 5 June 2017. ^ "Another set of remains found in raised Sewol ferry". CNN. 22 May 2017. ^ [단독]민정수석실 '세월호 문건' 입수…여론조작 조언도 [[Exclusive]Documents about 'MV Sewol' has been revealed. including the method about Public Opinion Manipulation] (in Korean). JTBC. 16 November 2016. ^ "South Korea | Country report | Freedom in the World | 2015". freedomhouse.org. Retrieved 28 February 2016. ^ "Korean Prosecutors Indict Japanese Journalist on Defamation Charge - WSJ". wsj.com. Retrieved 1 November 2016. ^ "US journal criticizes Park's regression into dictatorship". m.koreatimes.co.kr. Retrieved 1 November 2016. ^ "Park Geun-hye: Court ousts South Korea's scandal-hit president". BBC. Retrieved 10 March 2017. ^ "[Exclusive] The Blacklist Started with the Sewol". Kyunghwang Shinmun. 12 January 2017. "Teaching Case Study on Korea Ferry Disaster of April 2014." Year 25 Final Report Grant Number: DTRT13-G-UTC31. New England University Transportation Center, Massachusetts Institute of Technology. This page was last edited on 22 April 2019, at 01:48 (UTC).